The United States has one year to respond to the U.N. List of Issues for the U.S. 5th periodic review yet the U.S. has historically taken its sweet time in complying with standard procedures. The U.S. 4th periodic review was supposed to convene in Geneva in October 2013 yet had to be postponed to March 2014 due to the U.S. government shutdown. This photo is from the Kent State Truth Tribunal’s first visit to the United Nations in 2014 for the U.S. 4th periodic review with Jamil Dakwar and Laurel Krause. In the published extracts from your memoirs, you blame the news media for misinterpreting your categorization of student demonstrators as “bums.” Your remark was made just a few days before my daughter, Allison, was killed at Kent State University, on May 4, 1970, and you say you were “stunned” to learn of her death, and that of the other students shot by Ohio National Guardsmen. Your sympathy was such that you had to write personal letters to the parents of the four dead students, even though you “knew that words could not help.” If this is true, then why did you make such a mockery of your private grief for our sons and daughters by publicly implying that they were responsible for their own deaths and their killers blameless? “When dissent turns to violence,” you told the American people, “it invites tragedy,” but in your letter to my wife and me you expressed the hope that we could “take comfort from the sympathy the entire nation feels.” Words from fellow citizens, who really understood what had happened at Kent State, did help us, but from our President we expected much more than personal condolences and public political condemnation. Presidential action would have immeasurably tempered our grief and anger at the deliberate shooting down of our children, and on May 16, 1970, John D. Ehrlichman personally assured me that there would be no “whitewash” of what had happened. In other words, the Nixon Administration was committed to seeing that justice was done if Ohio exonerated all official and guardsmen from criminal responsibility, which a state grand jury did in October 1970. The cruel duplicity in these claims to personal grief and desires for justice have just been exposed for what they truly are by NBC-TV news. At a time (November 1970) when you well knew that I was almost begging for a Federal grand jury investigation of the killings, you instructed Attorney general John Mitchell not to convene a grand jury. How, I ask, does this square with your claims of personal sympathy? Watergate and the cover-up was your nemesis, but NBC-TV has not shown that your first obstruction of justice occurred six months after Kent State, when you “instructed” the Attorney General of the United States not to convene a Federal grand jury regardless of what the evidence might have warranted. To learn of your personal veto of a Federal grand jury months before Justice Department officials were assuring me that killings were still under “intensive investigation” is to prove, in my opinion, all the charges leveled against in the Watergate scandal. There is poetic justice in the fact that your self-serving account of deep sorry for the death of my daughter, Allison, and of Sand Scheuer, Jeff Miller and Bill Schroeder, should be published on the eve of NBC’s report on how you truly felt. Is there to be no end to your deceptions, omissions and outright distortions of historical fact? When she thinks about the time she spent in the parking lot, Mary Ann Vecchio’s thoughts shift back and forth between watching Allison Krause last attempts to speak and the massive hole torn through the back of Jeff Miller’s head. “I was shocked by all the blood. There was just so much blood,” Vecchio explained in the car on her way to Washington D.C. Wednesday, to voice her qualified support of a Kent State National Monument. Vecchio continued, “It was a sit down. The soldiers were lined up and yeah, they had tear gas, but we never expected that they’d shoot at us. Then they started coming at us with the guns with bayonets, in full riot gear, wearing gas masks. And I was scared to death.” After 46 years, Mary Ann still cries when she details the events of May 4, 1970, the fateful day that the Ohio National Guard opened fire on unarmed protestors at Kent State University. There were lots of kids at Kent that day. Four killed. Nine wounded. And hundreds more hit the ground when the bullets started flying, but only one was immortalized in a Pulitzer prize winning photograph that graced front pages from Cleveland’s The Plain Dealer to Newsweek magazine. John Filo, a photojournalism major in the crowd that day, opened his shutter and captured the horror and anguish of everyone on that campus. Vecchio’s picture remains one of the most impactful photos of the 20th century. Consequently, modern memory would remake Mary Ann Vecchio as the face of the Kent State Massacre. Sadly, at the time, Vecchio and the fallen protesters became the poster children for the Nixon Administration’s assault on the character of student protestors across the nation. Nixon himself called the students, “bums.” Back in her home state of Florida, the governor, Claude Kirk, called Vecchio a communist. Vecchio, not a Kent student, was a teen who had run away from home to protest the war in Vietnam. Kirk used her non-student status to character assassinate Vecchio. He said that she had been planted at the University by the communists and that she was responsible for the deaths of the students there. The press hounded her. The FBI hunted her. Local police profiled her. And she has yet to forgive herself for the pain she caused her parents. By 1990, even though popular sentiment had begun turning in favor of the student protesters, Vecchio had slipped into hiding. She’d stopped granting interviews except to ask reporters and their news agencies to leave her alone. She’d explain that Kent State had ruined her life. She didn’t trust the media – several of whom had turned her over to the FBI after she’d agreed to meet with them in the early 70’s. She was so heavily targeted that she couldn’t speak out against the injustice she’d witnessed. Vecchio wanted nothing to do with the fame and shame her time at Kent State brought her. Mary Ann Vecchio ventured out to address the National Park System Advisory Board about the possible designation of the Kent State Shootings Site as a National Monument. The campus at Kent State is owned by the state of Ohio. The parking lot where Jeffrey Miller, Allison Krause, William Schroeder, and Sandra Scheuer were killed is effectively public property. Creating a National Monument on the site should be pretty straightforward. Laura L. Davis, Professor Emeritus of English – herself, a student protester that day – and Mark F. Seeman, Professor Emeritus of Anthropology authored the application. In their submission they credit current faculty with assisting them in their collection of data for the application. They don’t however cite victims like Mary Ann Vecchio as contributors to the request, because Vecchio and others were omitted from the process. Fortunately, the National Park System Advisory Board rectified the applicants’ blunder. The board agreed unanimously that the Kent State site fit the criteria of historical significance but after lengthy discussion they also agreed that many appropriate accounts were missing from the story. The board charged Davis and Seeman with amending their applications to include the appropriate historiography associated with Kent State. The board reminded the applicants that this controversial event demanded the inclusion of different perspectives and – more importantly – that those perspectives be respected. There were reasons the protestors were killed at Kent State and all the evidence and every principle – especially the memories of the victims – must be included when available. The greatest gift any historian can receive is an eye witnesses to an event as well as the consequences that shaped the policies that followed. The board concluded, due to the complexity of the controversy over the excessive force used on protesting American citizens, the nomination is incomplete without the involvement of people like Mary Ann Vecchio. For the first time in Vecchio’s life, she feels like she was heard by agents of the government: a government that – until now – had only failed her. On the 46th anniversary of the Kent State massacre, attorney Michael Kuzma will bring a Freedom of Information Act lawsuit against the U.S. Justice Department, demanding records related to the FBI’s role in escalating situations on the campus. In the years since the killings on the Ohio campus on May 4, 1970, survivors, witnesses and victims’ families have sought to establish the FBI’s involvement. Kuzma wants that the Justice Department produce all responsive records related to Terrence Norman, reported at the time of the massacre to be a young FBI informant. Norman is believed by families and observers to have fired the first shots from a revolver and, in the chaos that immediately followed, Ohio National Guardsmen opened fire at unarmed Kent State student protesters, resulting in the deaths of Allison Beth Krause, Jeffrey Glenn Miller, Sandra Lee Scheuer and William Knox Schroeder and injuries to nine others. “The time to tear down the veil of secrecy surrounding the involvement of the FBI and Terrence Norman in the assassinations of four Kent State University students is now,” Kuzma said in a news release. COINTELPRO was a secret FBI program designed to monitor and neutralize non-violent protest groups and political dissidents deemed by the agency to be a danger to national security. The FBI has refused to release Norman’s dossier on privacy grounds. The government will have 30 business days to answer the complaint. Another May 4th parent has died since last we gathered to commemorate this event. Another mother has left us before the truth is clear and justice is served. My aunt, Doris Krause, Allison’s mother, passed away peacefully under hospice care and in the arms of her sole surviving daughter Laurie on January 17th, just a few months ago. As she crossed over, she left behind decades of profound grief and struggle. Perhaps it is our world she now grieves. A world she taught her children to believe was just, civil, compassionate, and fair. Please join me in a moment of silence for Doris Levine Krause. May her memory be a blessing to us, may her struggle be released, may her quest for truth be carried forth. I never met my cousin Allison. I was a little nine month old learning to walk and run when she was stopped in her tracks by an M1 bullet right over there in the parking lot. So I have always been looking for the truth myself, searching for accounts that would provide clarity and do Allison and May 4th justice. It concerns me that this history be told and recorded accurately. Among the articles I have found was a 1971 piece, published in the National Review, by William F. Buckley. For 46 years we’ve been parted from my cousin Allison. A lifetime! My lifetime. For 46 years we’ve sought answers. 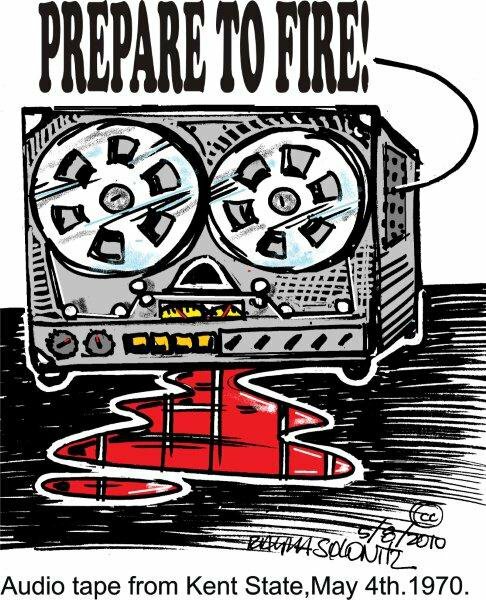 For 46 years the government’s been adept at denying culpability, avoiding responsibility and suppressing truth. For 46 years we’ve been lied to and brushed aside. We now know there was an order to shoot; we’ve heard it. Don’t tell us you were afraid for your lives with your loaded M1 rifles and your helmets and your high ground advantage. Don’t tell us you felt endangered when Governor Rhodes himself, your commander in chief, came to town to cheer you on and gave you carte blanche to “eradicate the problem.” For 46 years we’ve called for truth. My uncle Arthur led the legal battle for 10 years following May 4th. While we agreed to a settlement, we were not satisfied that truth was honored nor that justice was done. In a 1981 interview with J. Gregory Payne, my infuriated Uncle Arthur declared “We don’t want the damn money… we want the truth! We want the facts about how the four died. We aren’t afraid of the truth. We aren’t the ones who have been saying “no comment” for the past 10 years.” He went on: “I think we are all responsible for the killings at Kent. You can’t get away from the hatred being spread by national leaders during that time. That political period was one which bred hate and with Nixon and Rhodes fanning the fires you can expect killings as a result.” With all the hate speech going on these days by political leaders, I shudder to think what’s ahead, and like my cousin, I will not allow the hate to go unchallenged. Allison Beth Krause was the cherished first of two daughters born of Arthur and Doris Krause of Cleveland Heights, Ohio. She smiles at me whenever I see her, there in a handful of black and white photos. The impish seven year old girl sits there in a white dress and patent leather shoes next to her little sister Laurie, in the front row of a family portrait taken at my aunt and uncle’s 1958 wedding. I long to reach into the photographs and take her hands and play with her, hug her, know her. Back in those days in the early sixties, the Krause’s used to go on Sunday drives out in the country around Cleveland, often ending up at Kent, dining at the Robin Hood and enjoying the pastoral campus. Remarkably, at a very early age, Allison made her decision to attend college at Kent State University. She loved it here; she felt at home. She felt safe. As she found her political voice in high school, Allison joined other students who were opposed to the war in Vietnam, especially as friends got drafted. As a teenager, Allison participated in anti-war demonstrations. She knew that as an American she had a right to freedom of speech and a right to engage in peaceful assembly. She entered Kent State University in the fall of 1969 where she quickly made friends, earned high marks in her studies, and met the love of her life, Barry Levine, another young student from New York who shared her values. Together they assembled with others on Friday May 1st on the commons to raise their voices against Nixon’s decision to escalate the war and send more troops into Cambodia. She spent that first weekend of May with friends, doing schoolwork, enjoying the first breath of spring and becoming increasingly concerned about the military presence on campus, now occupied by the National Guard. None of the four dead or nine wounded were armed that day with anything truly threatening but their voices that challenged the state’s right to kill. State-sponsored violence against peaceful but vocal citizens was permissible in 1970. This precedent paved the way for continued ongoing police aggression across the country that is with us to this day. While we commemorate this sad anniversary, let us understand that in the days that followed the Kent State killings, precious lives were lost at Jackson State as well. Yet Jackson State has not remained in the national memory in the same way that Kent State has. As Samaria Rice joins us here today, a courageous and outspoken mother standing up to the police who took the life of her son Tamir, we are reminded that while our Kent State students were murdered for their political beliefs, to this day American citizens continue to be targeted simply on the basis of their race. It was a feature of the killing at Jackson State that tragically and egregiously continues to this day. I would like to take this occasion to remember Jackson State, as well as to honor the life of young Tamir Rice. My cousin Allison would want us to do this. My name is Jennifer Schwartz. I find pebbles in my pocket every time I visit Allison’s grave, carrying rocks with me to lay upon her headstone as a symbol of my remembering. Originally published in The Vindicator, Youngstown, Ohio: Sat, October 9, 2010 @ 12:09 a.m.
Laurel Krause might learn more today about the May 4, 1970, Kent State University shootings that killed her sister Allison Krause and three other students — including Sandra Scheuer of Boardman. A newly enhanced recording made 40 years ago features a call to fire and the sounds of a skirmish — and previously unheard gunfire from a .38-caliber pistol 70 seconds before the National Guard shot into the crowd of students. Filmmaker Michael Moore and the Kent State Truth Tribunal are in New York City today to webcast the testimony of dozens of witnesses and play the cleaned-up audio. The event from 10 a.m. to 5 p.m. today and Sunday will be shown at http://www.michaelmoore.com. “This is compelling new evidence,” Krause said of the recording. The [Cleveland] Plain Dealer asked Stuart Allen, president of the Legal Services Group in Plainfield, N.J., and Tom Owen, president of Owl Investigations in Colonia, N.J., to evaluate the recordings in May. Allen said he spent more than 50 hours using high-tech software to enhance the smallest of sounds on a copy of a recording made by a student that day. Allen said he was originally charged with finding evidence of rumored sniper fire before the shootings. He found none, but instead found the clear order to fire — and something else. That spot has the sound of what Allen confirmed to be pistol fire and frantic witnesses. “I had heard what appeared to be a chase. Someone called out, ‘He’s running! Get him!’ Then you hear the crowd swell up; then you hear the crowd come down. There are little conversations going on, then you’ll hear, ‘It looks like they got someone,’ from student observers. The tussle and pistol shots, if authenticated, match some key details of a confrontation several witnesses reported seeing or hearing involving a pistol-waving Kent State student named Terry Norman, The Plain Dealer story said. Norman was photographing protesters that day for the FBI and carried a loaded .38-caliber Smith & Wesson Model 36 five-shot revolver in a holster under his coat for protection. Though he denied discharging his pistol, he previously has been accused of triggering the Guard shootings by firing to warn away angry demonstrators, which the soldiers mistook for sniper fire. Seventy seconds later, Allen said you hear the call to fire, which lasted 13 seconds, killing four students and injuring nine. The meaning of the skirmish before the guard firing is still under investigation, but some student witnesses have said they saw a man waving a pistol before the shootings that day. Some speculate it was his gunfire that prompted the guard to open fire on students, fearing guardsmen had been shot at by a sniper. Links to video testimonies can be found at http://www.truthtribunal.org. The Kent State Truth Tribunal (KSTT) was founded in 2010 upon the emergence of new forensic evidence regarding the May 4, 1970 Kent State Massacre. 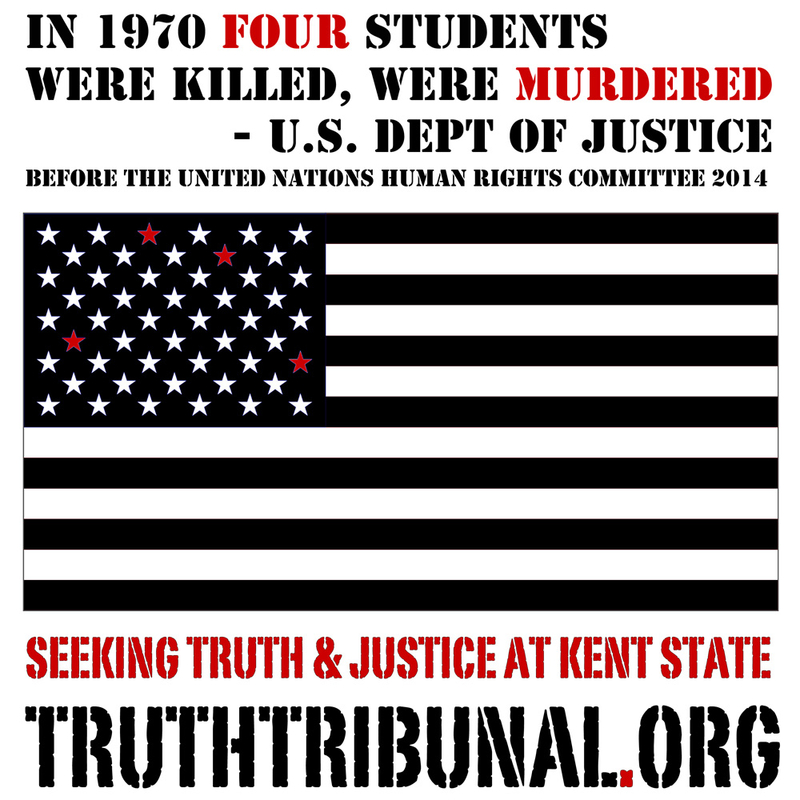 KSTT is an NGO focused on revealing truth and bringing justice to Kent State Massacre victims and survivors. Less than a day before her unlawful killing at Kent State University, Allison Krause said, “What’s the matter with peace? Flowers are better than bullets”. On May 4, 1970 Allison Krause was shot dead by U.S. military personnel as she peacefully protested the American Vietnam War and stood for PEACE. Representing Allison Beth Krause, 19-year-old Kent State University student protestor slain on May 4, 1970: Doris L. Krause, mother & Laurel Krause, sister. At the US 4th Periodic Review on March 13, 2014, two UN Human Rights Committee members addressed the submitted issues of the Kent State Truth Tribunal. Messrs. Walter Kaelin and Yuval Shany flagged the United States regarding the killing at Kent State in several expressed reasons including lack of accountability, concerns related to command responsibility, the use of excessive and deadly force by the military and law enforcement, and US investigatory practices when credible, forensic evidence emerges 40 years later. RECOMMENDATION: The United States must examine forensic evidence of expert Stuart Allen’s digital analysis of the Kent State tape and acknowledge his findings. When the United States Delegation said, “In 1970, four students were killed, was murdered”, the long held US position that the killings at Kent State were simply a ‘civil rights’ matter was extinguished forever. Instead of examining the Kent State tape that emerged in 2010, the US Justice Department has refuted the provenance of the tape, ignored the new evidence, confused what was discovered, discredited the forensic expert and censored the 2010 forensic findings in the Kent State tape. This behavior echoes the tremendous effort on the part of the US government, Kent State University and US Justice Department to hamper and derail efforts for restorative justice to be achieved and Kent State truth to be known by the public since May 4, 1970. Back in 1979, after nine years of civil litigation, where Kent State plaintiffs sued for wrongful death (the only legal option in the American judicial system), an out-of-court civil settlement was reached, including $15,000 paid by the State for the death of Allison Krause and a statement of regret signed by the Kent State shooters. Rediscovered on September 2014, was the Kent State Civil Settlement Statement of 1979, authored and signed by the plaintiffs, which shared the sentiments of all harmed in the May 4th Kent State Massacre. The Settlement Statement includes hard-fought-for recommendations to the US government that were patently ignored, never implemented and could have protected the lives of countless Americans. Following the emergence of the new Kent State evidence, in 2012 Kent State University constructed a $1.1 million visitor center near the killing site. The visitor center exhibits are not factually accurate and whitewash US government complicity; the new Kent State tape evidence is buried, and when mentioned, criticized. In 2011, forensic expert Stuart Allen was interviewed by CNN on his findings in the Kent State tape and until recently the interview was available to be viewed at CNN.com. This year Stuart Allen’s CNN Kent State interview was removed from the CNN website; watch the CNN scrubbed Stuart Allen interview on youtube. Will we ever learn the truth of what happened at Kent State? To date there have been no credible investigations into what occurred at Kent State. This is a terrible precedent. Americans still do not have access to true knowledge through credible investigation of what occurs when US law enforcement and the military kill civilians. The same, flawed US grand jury system only exonerates and protects the police and those in authority. There is no facility for redress in America. Instead victims and surviving families are encouraged to “move on” yet many survivors suffer from harassment by the FBI for many years to come. RECOMMENDATION: In the coming days, the Kent State Truth Tribunal will be making application to the Special Rapporteur on Extrajudicial, Arbitrary and Summary Execution, Mr. Christof Heyns. Mr. Heyns was recommended by Ms. Maria Clara Martin, Chief Americas Sections at the UN in March 2014. When the courts fail to bring justice to the injured and when governments prefer to neglect their role in such tragedies, families sometimes turn to alternative means of gathering the truth. After years of exhausting efforts to find out what happened on the day of Allison’s death, and failure to receive any meaningful recognition for the injury suffered by our family, we established the Kent State Truth Tribunal on the 40th anniversary of the killings. We felt the imperative to do this for our family and to come together with others to create an accurate historical account of what occurred at Kent State, also honoring and preserving the first person narratives of original witnesses and participants. When young Michael Brown was shot to death by US law enforcement in Ferguson, Missouri on August 9, 2014, Allison’s family watched the efforts of the United States to investigation Michael Brown’s unlawful killing, especially noting the parallels between Michael’s killing and Allison’s. First a State grand jury was instituted and at the conclusion, those in authority failed to bring criminal charges for killing and exonerated US law enforcement. We recognized the similarities in the government’s handling of the killings at Kent State. The results were almost identical with the State grand jury not capable of indicting the police officer that shot Michael dead. Those in authority in Ferguson and at the US Justice Department viewed the killing of Michael Brown through a ‘civil rights’ lens, outrageously ignoring the much more critical crime involved in Michael’s killing by US law enforcement. Ever since August 2014, deaths of people of color, particularly young people, at the hands of US law enforcement, have been dealt with as civil rights issues, neglecting to hold anyone accountable for the State killing civilians. In America there is no recourse, nor any other judicial avenue, no possibility for redress for acts of State-sponsored murder. It has become clear that accountability is impossible in the current American judicial system. Because of the flawed system and since the witnesses and participants of civilian death by US law enforcement at Ferguson (Cleveland, Baltimore and more) will not have their truth recorded, known or honored, we wish to offer the use of the Truth Tribunal methodology to enable a citizen-organized campaign for accountability in these situations. RECOMMENDATION: The Kent State Truth Tribunal seeks direction and support from the United Nations in offering the facility of citizen-organized Truth Tribunals to those harmed by State-sponsored, unlawful killings in America. Our goal is for the KSTT and the United Nations to work together to bring restorative justice and accountability to the United States. How may we get started? Later in 2015 we will be inaugurating the Allison Center for Peace, a peace destination in America, creating an environment for the discussion and development of peaceful solutions, and focused on fostering peace in America. As we form our center for peace in America, we invite the United Nations to become involved as a founding partner. RECOMMENDATION: The Kent State Truth Tribunal wishes to explore an on-going relationship with the United Nations in the development of the Allison Center for Peace on the Mendocino coast of Northern California.